Our terpene-rich oils are extracted from high-potency, organically grown flower. No butane or other toxic solvents are used in our process. No cutters, fillers or color-removers are added – just pure, high-potency, strain-specific CO2 oils with robust native terpene profiles. Like a fine wine, cannabis has an incredibly complex aroma and flavor profile that we preserve through our proprietary CO2 extraction process. Terpene and cannabinoid test results are reported on the backs of our products. Both seasoned connoisseurs and cannabis newcomers will appreciate our naturally balanced concentrates. All of our concentrates are packaged in high-quality glass and metal materials. 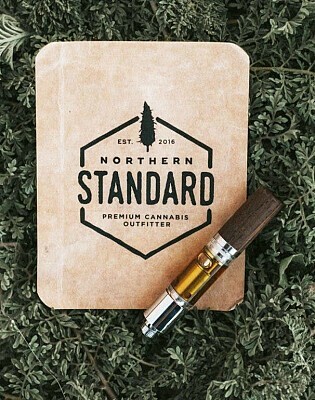 Both our wood tipped refillable carts and metal tipped disposable carts are made with Ceramic cores to allow for big draws without changing the flavor of the oil. We do not use additives, fillers or cutters of any kind. Northern Standard is a product you will return to time and time again.